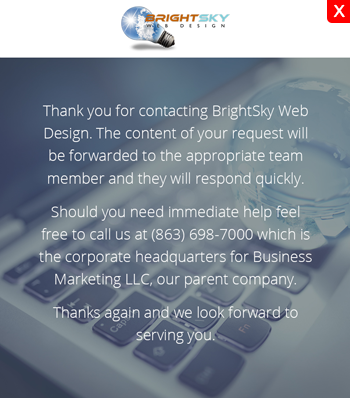 Copyright © 2011 BrightSky Web Design a Business Marketing LLC company. All Rights Reserved. Oooh my! Time to speak to BrightSky! The success of an online business in Lakeland will depend on the website design of that e-commerce site. Don’t believe it? As a customer, you can imagine navigating a website, right? Now, imagine that website to have heavy animations and is loading slower than usual. Would you want to continue browsing through the site? Would you still purchase that item you want to buy even if you are feeling a little bit insecure about the website’s design? An online business is only as good as its online presence will allow it to be. This will be your brick-and-mortar store. This will be where your customers will congregate and will decide whether to purchase your products and subscribe to your business. They have to feel the most secured while navigating your website. Since they are providing you with personal information, their email address, and credit card details, you are duty-bound to protect your clients and provide them with the best care and customer service. Call us now to set up a free consultation. discuss your online plan and goals. Since more and more users are using their mobile phones and tablets to access website these days, it is important that your web design is responsive to different devices. This means that when a potential customer opens your website on his smartphone, it should appear as well-designed as it is when he opens it on his laptop. He would also access that website on his tablet. The website should appear the same across all platforms and devices. Once you achieved this, your customers would be happy to check out your website no matter what device they are holding at the moment. It becomes easier for customer conversion when they are satisfied with your website. They are more likely to browse the site, find the information they need, and purchase the items they want when the website is responding well. A web that is well-designed in Lakeland will use elements that will attract customers and could enable your business to build a clientele portfolio that will support your products and services. A poor-looking website can damage the brand of your business. Remember that your website will also be the focal point of your brand. Your website will use the same colors, the same logo, the same fonts as what appears on your office stationary or other elements of your branding materials. When the website has a poor performance or is not properly designed, there is a big chance that your brand will get adversely affected across all platforms. Your customers will see your brand as poorly constructed. A scummy-looking web design will drive customers away. On the other hand, an elegant website will help people connect better with the branding of the business. You must ensure that your website has a user-friendly interface so that it will attract clients to do more business with you. Google Analytics publishes an Audience and Behavior report that would tell you how customers in Lakeland are interacting with your website. The report uses a variety of metrics that include, among others, the bounce rate, the exit rate, the conversion rate, the engagement, and the site speed. The bounce rate will signify the proportion of visitors that did not interact with your web page. The exit rate shows the number and percentage of visitors who leave the website after reaching a particular page. The conversion rate is an indicator of the percentage of visitors who end up buying an item from your website. The engagement is the indicator that shows how much visitors interact with the website. And finally, the site speed will measure how fast the web design loads. If the load speeds are too low, visitors may quit and want to leave. Improving the speed of the website will also greatly boost the conversion rate of the website and will attract more visitors to it. The importance of web design in attracting Lakeland customers cannot be highlighted enough. Realizing that these elements are critical to the success of your online business is of primary importance in empowering you to address the issues first hand. Copyright © 2018 BrightSky Web Design a Business Marketing LLC company. All Right Reserved.